Yamaha has announced the release of its newest additions to the DXS Series of powered subwoofers, the DXS15mkII and DXS12mkII. Yamaha states that, these new models offer an upgrade in performance from the previous DXS15 and DXS12, delivering higher maximum SPL from a more powerful amplifier, as well as an extended low frequency response. Both models feature an upgraded 1020W Class-D amplifier and a 15” or 12” powerful woofer, now housed in a sturdier band-pass type plywood enclosure. Able to deliver 3dB higher SPL and 5Hz lower LF than their predecessors, the DXS15mkII can deliver an impressive 135 dB maximum SPL and an extended LF response down to 40Hz, while the DXS12mkII can produce 134 dB SPL and reach down to 42Hz with exceptional clarity and minimal distortion. They also feature D-XSUB original Yamaha proprietary DSP technology for additional control of the low frequency range via two selectable modes— BOOST and XTENDED LF— as well as a selectable crossover with three different options (80/100/120Hz) for various applications. 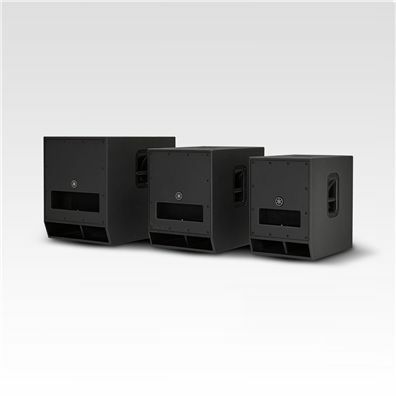 For larger applications using two or more subwoofers, the DXSmkII offers a “Cardioid Mode” setting which effectively reduces the SPL of bass that reaches the stage while increasing the bass levels directed at the intended audience. For even more portability and versatility than the current lineup, the new models are more compact and lighter weight, with the DXS15mkII and DXS12mkII seeing a reduction of 2kg and 3kg of weight respectively. They also come equipped with both M20 and 35mm pole sockets allowing for more flexible set up options, as well as an optional wheel kit for more efficient portability and set-up. Yamaha also offers the optional speaker covers with a functional design that provides added protection from unfavorable weather conditions during outdoor performances, dusty and dirty warehouse storage, or the rigors of road travel.